Hello October! And Greetings to everyone, happy Autumn! It's been awhile since I've written, but here I am and can you believe that 2017 is almost over? How did that occur? Here in the south ( Ga.) it still doesn't feel much like fall, contrary to all the seasonal merchandise in the stores hinting for us to purchase jackets, pumpkins, and Halloween or seasonal décor. Speaking of décor, I have a NEW painting, just in time for Halloween. 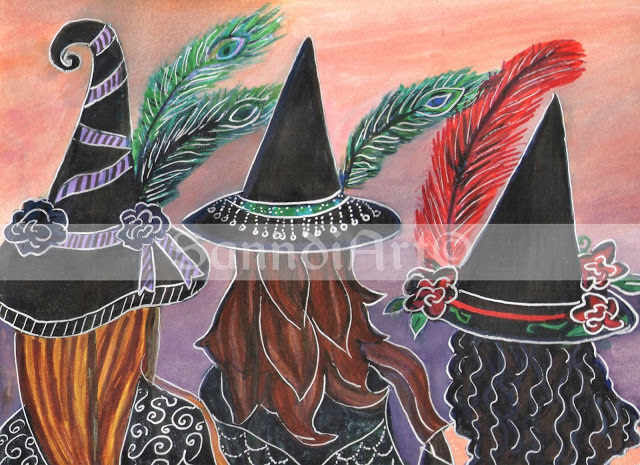 It is entitled Waiting For Sundown.Three "witchy" friends stand united in fun, frolic, and friendship decked out in their finest witchy-poo attire while waiting for sundown. And who knows what happens after dark? This print is a limited offer due to it being seasonal, so order yours while you can!